As a follow-up to my post about tea, I realized that I never posted about our other homemade-beverage machine: the SodaStream. Yes, I take issues with it being “soda” instead of “pop”. Though I justify it by telling myself that the machine itself makes fizzy water, or “soda” … and through the application of flavored beverage syrups, I turn it into full-fledged POP. 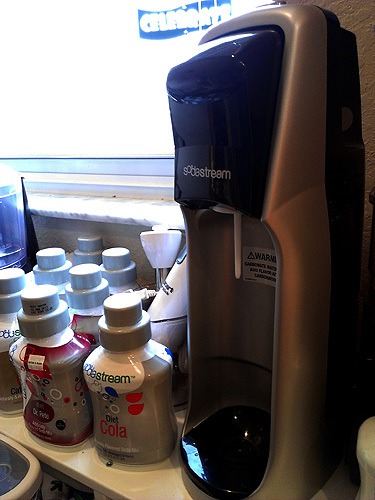 We got the very base model, the Sodastream Jet. (I link to it here at Amazon, because of the affiliate link, but we got ours in person at Target.) There are other, fancier ones, but we weren’t sure that we would use it enough to justify the expense of a nicer model. It’s pretty easy to use, overall — you put a cylinder of CO2 in the machine. Then you fill a 1/2- or 1-liter bottle with water and chill it in the fridge (colder water carbonates easier, they say). Screw the chilled bottle of water onto the machine, and press a button on the top repeatedly, squirting CO2 into the water, until you hear what they call a “buzz” sound. Me, I call the sound more of a fart, but then again, I’m 13 years old on the inside. Three farts is average fizziness. You can go fewer farts, or maybe even up to 5 farts if you want really fizzy pop. 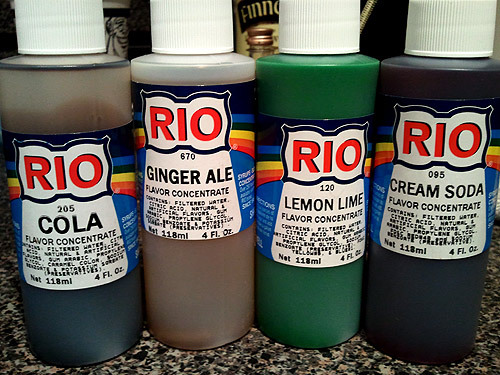 There are a ton of syrup flavors, ranging from the regular old cola to weird ones like pink grapefruit (which Scott likes, though it tastes like [ugh] Fresca to me), to their own Dr Pepper clone, “Dr. Pete”. As you can see, we have a number of syrup bottles lined up there. So how do we like it? How much do we use it? The answers: a lot, and a lot. We’ve always been big pop drinkers, and this really cuts down on lugging cases of cans up the stairs. And we don’t have to stock cans in all of the different flavors — if you’re in the mood for something, you just have to take one of the bottles of cold water out of the fridge (we got a number of extra bottles, so there’s always one cold) and mix up whatever flavor you’re jonesing for. On the flip side, we probably drink LESS pop than we did before, since it’s not as easy as grabbing a can and cracking the seal — you have to actually get up the gumption to fizz up the bottle and mix up what you want. The diet flavors are all made with Splenda, which took a little getting used to, since we were used to Diet Coke (sweetened with aspartame). I know many people out there have conflicting opinions of which is better or worse for you, so take that into consideration. Apparently their regular versions are sweetened with a mix of Splenda and cane sugar, with no high-fructose corn syrup. You can also find, in the magical wonderous world of the internets, flavor concentrates for sale. With these, you basically make your own simple syrup from whatever sweetener you choose, then add the flavor concentrate, and you’ve made your own syrup. 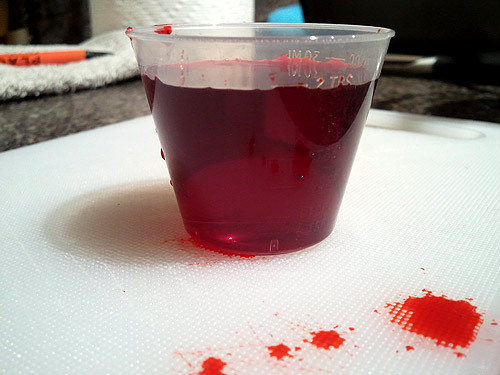 Like cough syrup! Although Scott has found out from some people that red cream soda is actually a thing. Maybe in the south. I’m not sure. At any rate, we love the crap out of this gadget, and I now wish we’d spent more on a nicer model (not that this one isn’t nice, but the plastic parts can feel a bit cheap at times). When this one gives up the ghost eventually, we’ll totally upgrade. As for the flavors, I really like the diet cola. And I use both regular and caffeine-free, usually mixing the two together in a half-caff version. The ginger ale is also great, although I find I need a little more syrup than the little lines on the inside of the measuring cup recommend. Root beer, great. Scott says the Dr. Pete is really good, but he also mixes up his own “Dr. Meyer” mix, which is half Dr. Pete and half caffeine-free diet cola. Says it’s even more like actual Dr Pepper. The only flavor I didn’t like was lemon-lime, which tasted really artificial to me. But then again, I’ve been eating lemons whole my entire life. I’m probably just a lemon snob. I advise getting some extra bottles, so you’ll always have chilled water on hand. We have three one-liter bottles, and four half-liter bottles — the half-liter bottles are colored orange and green, so we each have our own two. (I’m orange.) They fit perfectly in our lunch bags, which is nice for taking to work. I also advise getting a spare CO2 cylinder, so you always have a full on hand to swap out when the one in the machine runs dry. When they’re empty, you can trade in the empties for full ones at a discounted price — Bed, Bath and Beyond will swap your cylinder for $15 (a new one costs $30). They also carry a large collection of syrups. You can also find the syrups at Target, Macy’s, and (weirdly) Best Buy, among other places. Red cream soda is the default in Canada. I was an adult the first time I had an old-fashioned vanilla-flavoured unred cream soda. Strangely, even here in Canada, land of pop, we don’t say cream pop instead of cream soda. So does the red stuff taste like vanilla, like the clear stuff does? And agreed — that specific item is always cream soda, even though I’ll call fizzy drinks pop until the day I die.